Seoul, Korea & San Jose, CA, February 26, 2010- Displaybank, a global authority in market research and consulting for the display and solar industries, today announced that touch screen panel market will continue to show over 30% CAGR by 2013. Touch screen panel market created $2.45B in 2009 and expected to create $36.4B in 2010 and $73.7B in 2013. Displaybank also forecasts that touch screen enabled application products reached 280M units in 2009 and expected to reach 420M units in 2010 and 800M units by 2013. Touch screen panel market in 2010 is expected to show growth focused in mobile phone application and share of mobile phone in all applications equipped with touch screen would reach 62%. Touch screen equipped mobile phone is expected to show increase of 42% Y/Y to reach 260M units in 2010 and the share of touch screen mobile phone in all mobile phone application is expected to grow from 12.8% in 2009 to 20.2% in 2010. While more mobile phone utilizing capacitive type than resistive type are launched from Apple’s iphone effect, global mobile phone brands are known to plan to expand capacitive type in order for multi touch as well as softer touch. 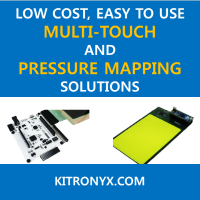 With this plan, touch screen manufacturers are expanding capacity focused in capacitive type. In 2010, mobile phone utilizing capacitive type is expected to increase 53% Y/Y and the share of mobile phone utilizing capacitive type in all mobile phone application is expected to reach 40%. Monitor and NotePC market are expected to equip more touch screen panel through the release of Windows 7. Even though products equipped with touch function will be reflected with price premium, medium-to-large size touch screen panel market would be reflected with expansion as major brands and consumers acknowledge touch function as the key function of Windows 7. In the first half of 2010, NotePC panels with touch function for sizes focused in 10.1”, 16.1” and 13.3” will be launched and 21.5”, 23.6” and 27” for the monitor panel that monitor and NotePC market would see continuous launching of new products equipped with touch screen panel in 2010.